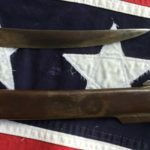 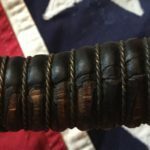 Some of the neatest edged weapons produced were made during the Civil War. 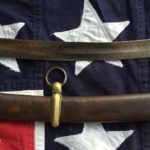 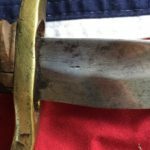 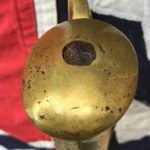 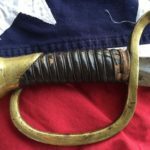 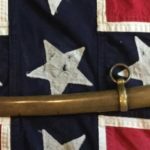 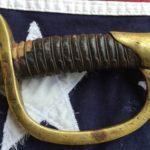 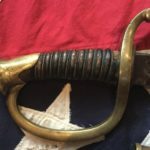 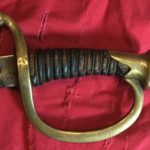 The Artillery Sword which was obsolete at the outbreak of the war is arguably the neatest of all, even though most were made before and during the Mexican American War. 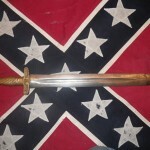 Which leads me to my next example of Civil War Arsenal Weapons. 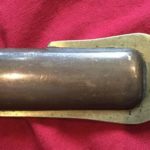 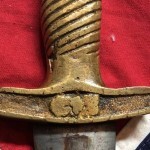 The first example is of the M-1832 Foot Artillery Short Sword. 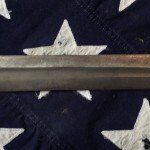 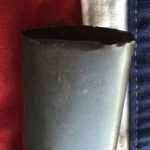 This is the most common U.S. example of the artillery sword. 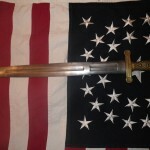 Manufactured by Ames in Springfield Mass. 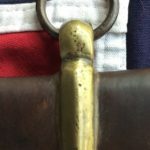 and stamped U.S, makers mark, date and inspector. 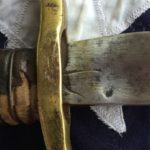 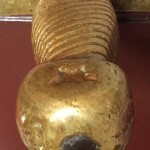 These swords have a fish scale handle with an Eagle on each side of the pommel and have 3 fullers on each side of the blade. 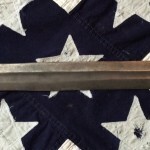 The overall length is 25″and the blade is 19”long. 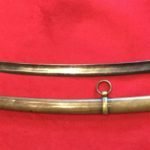 This sword would have been used by artillery men to swipe at the bodies of horses rushing them, but this was a very Napoleonic type of fighting and like I said earlier by the outbreak of the Civil War this was an obsolete way of warring. 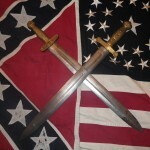 However obsolete I still love these swords. 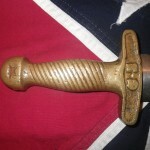 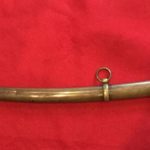 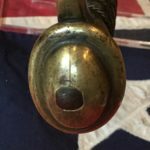 My next example is of a Confederate Foot Artillery Sword (Maker Unknown). 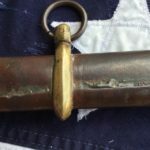 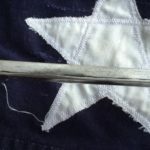 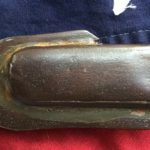 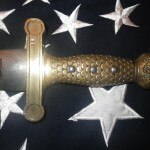 Because of the star in the pommel this sword was originally thought to be of Texas background and others claimed it was carried by the Louisiana Tigers the assumption was based on Lord knows what logic (William A. Albaugh III Quote). 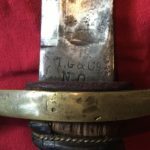 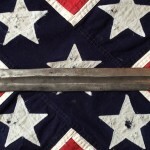 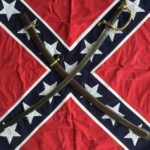 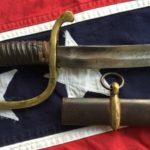 This sword is the most common of all Confederate Edged Weapons, yet its maker remains unknown. 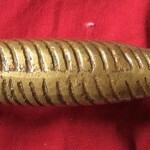 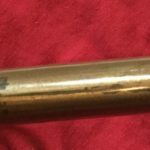 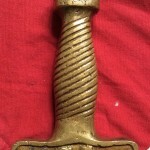 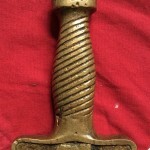 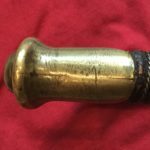 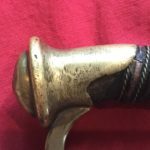 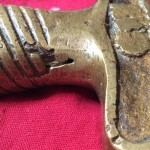 The hilt is brass, very poorly made cast, so much so that the C.S. 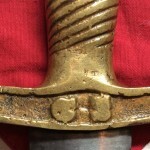 in the cross guard can barely be identified and the Star in the pommel lacks the points. 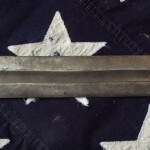 The blade is 18 ½ long, double edged with an unstopped fuller on each side. 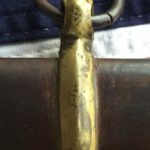 No makers mark appear. 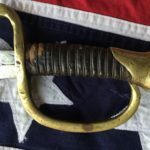 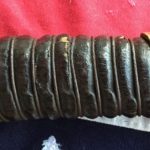 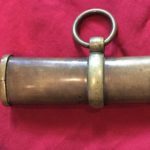 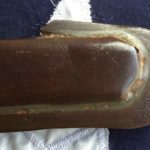 If you’re lucky enough to have a scabbard it would be made of wood with tin mounts, but I have also seen ones made completely of tin but I’m not sure if these were Civil War accurate. 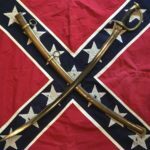 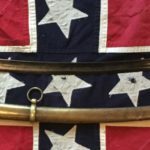 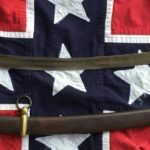 Most Civil War Historians believe these were made somewhere in Georgia or possible South Carolina, but we’ll probably never know for sure. 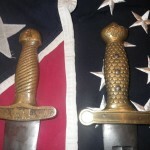 William A. Ablaugh wrote in his Confederate Edged Weapons Book (The Bible of CW Edged Weapons) It is for sure that the Star in the pommel has no Texas connotation and I am sure that the Louisiana Tigers would have turned up their noses at such a weapon due to the lack of quality.